Mix one scoop in 200ml - 300ml of water or skim milk. Then blend, shake or stir for 20 - 30 seconds or until powder is disolved. Total Science ISO-Slim is an advanced weight loss supporting protein powder that contains a unique blend of sustained release protein with added researched fat burning ingredients including; Green Tea Extract, Green Coffee Bean Extract, Garcinia Cambogia and L-carnitine. Total Science ISO-Slim contains our HCT (Hormone Control Technology) blend of 3,3’-Diindolylmethane and Diadzein, two major ingredients that assist in balancing hormones and weight control. 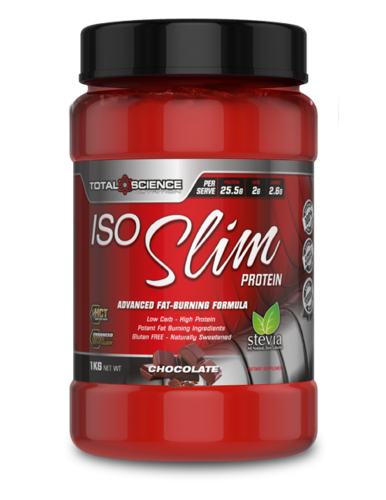 ISO Slim is a perfect protein for anyone who wants to lose weight or lean down. ISO-Slim is naturally sweetened with Stevia so NO nasty artificial sweeteners.